Yang Allen alley578@newschool.edu PhD Comparative Politics; Global Politics/ IR; East Asian Politics. Geeti Das dasg927@newschool.edu PhD American politics; theories of institutional change; gender and sexuality; classification and bureaucracy; race and ethnicity; South Asian politics; social movements; science and technology studies. 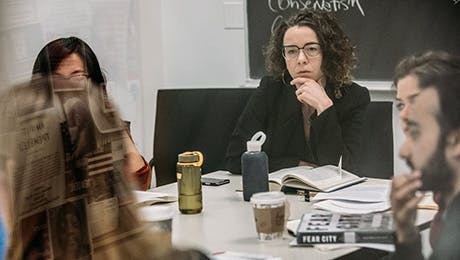 Maria Begona Gerling Sarabia gerlm337@newschool.edu PhD History of Political Thought, Contemporary Continental Political Theory; Democratic Theory, Dictatorship and Tyranny; Latin American Political Thought; Critical Theory, Latin American Postcolonial Theory, Eurocentrism. Louis Jargow jargl574@newschool.edu PhD The History of Political Thought, Ancient Greek Politics, Civil War, Homeric and Tragedy Studies, The Paris Commune, The French Revolutions, Anarchism, Left-Libertarianism, Radical Democracy, Mutualism, Insurrectionism, US Social Movements, Occupy Wall Street, Black Lives Matter, Policing, Criminality, Black Studies and Race Critical Theory. Scott Ritner ritns028@newschool.edu PhD Critical Theory, Mysticism, Marxism, Heterodoxy, Jewish Political Thought, Literature and Drama, History of Political Thought, Platonic Political Thought, Political Theology, The Critique of Political Economy. Katinka Maria Wijsman wijsk799@newschool.edu PhD Global Environmental Politics, Political Ecology, Feminist Science and Technology Studies, Environmental Justice, Critical Geography, Critical Cartography, Sustainability Science. Veronica Alicia Zebadua Yanez zebav450@newschool.edu PhD Modern and Contemporary Political theory, Feminist Theory, Hannah Arendt, Simone de Beauvoir, gender and politics, Violence Against Women.